WBFO has won six awards in the New York State Broadcasters Association's annual Excellence in Broadcasting competition, with reports ranging from breaking news to stories of human interest. WBFO took home more awards than any other public or commercial radio station in New York State, excluding colleges, on Monday at NYSBA's regional award luncheon in downtown Buffalo. (From left) Valentino Dixon stands outside the Erie County courthouse as a free man after spending 27 years in prison for a murder and assault he did not commit; Dr. Fred Lewis explains the function of the Model 40 Rotorod Sampler; Alex Valvo, wearing his on-ice official's sweater, stands in one of the many rinks where he works hockey games; BPO Cellist Robbie Hausmann plays a tribute to his German great-grandmother. Avery Schneider, Ryan Zunner, Nick Lippa and Marian Hetherly's news coverage of Valentino Dixon's exoneration for a wrongful conviction and release from prison after 27 years won for Outstanding Spot News. Schneider's feature, "Allergy season is back, but how do we know what's in the air?" about an Olean-based allergy specialist who has been tracking pollen and mold spores for more than three decades won Outstanding Feature. Michael Mroziak's human interest feature, "Gay referee reflects upon his biggest call: revealing his sexuality," won for Outstanding Sports Coverage. This was the second year in a row Mroziak took home an award for the category. In the Outstanding Use of Audio category, Nick Lippa won for his feature, "BPO cellist reflects on his family's history while playing at Auschwitz," about a member of the Buffalo Philharmonic Orchestra who honored his German great-grandmother with music. The WBFO News team's extensive reporting on the 2018 elections won for Outstanding Election Coverage. Included in the coverage was reporting in the days and weeks leading up to the elections, reports from polling places and political headquarters on Election Day, live special coverage as results were tallied, and analysis on the following morning. In a new category to the awards, the WBFO News team and their many videos broadcast on Facebook Live and won for Outstanding Social & Digital Media: Live Local Coverage. 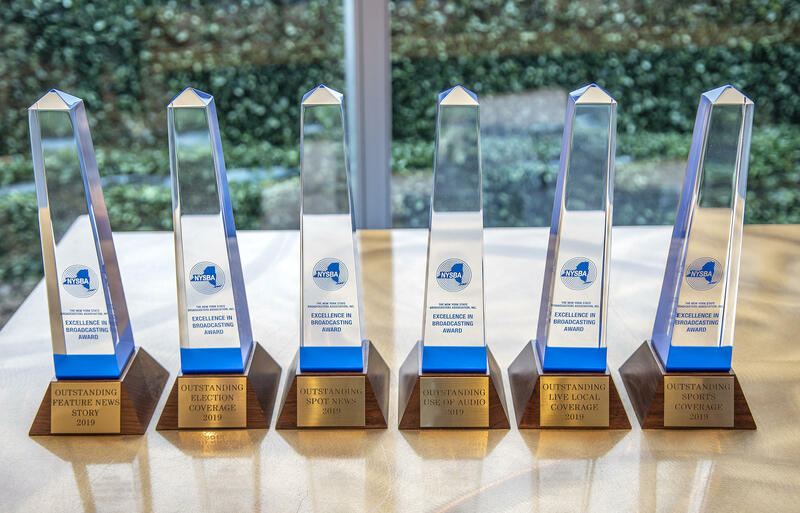 WBFO has won four awards in the New York State Broadcasters Association's annual competition, with reports that ranged from fatal accidents on unstable ice to a hockey fund-raising marathon.